I’m not called by my first name because…you don’t remember the famous black boxer we had, Joe Lewis. I went through high school and always down here, as Ryder. As soon as I got in the military, they go by your first name, middle initial, so Joseph R. Lewis becomes Joe Lewis right quick. My grandparents lived down here, on the Lewis side, and bought about 150 acres of land in 1907, or somewhere along there. And the deed says they paid $400 for it and it was in the woods, in the jungle. Right where our house was, was in the woods. They deeded out quite a bit of it to their different children. But when they died, there was still 30 or 40 acres of it that had not ever been distributed. And furthermore, I’m one of the few people in a big family that was able to go to college and get a good job. But, when I started to work with the Corps as a graduate engineer, in 1952, my annual salary was $3,410 a year! It was just like a jungle. And, I had it surveyed after I started doing a little something here. The original survey called for seven and a half acres. The thing about it was, it went out into the Sound area a hundred or more feet, I couldn’t claim that, so I actually wound up with about six acres or something like that. The old shopping center down here, coming from 421 all the way to St. Joseph’s Street belonged to two aunts. One of the aunts had the old, original Lewis home and she had no income. She was an old maid and the county was giving her something like $30 a month and putting a lease on the property. So I told Aunt Rose that I’ll buy that place, I’ll take your house, and I’ll pay off that lease and I’ll put lights, electricity in the house, which they didn’t have, and I’ll take care of you as long as you live if you’ll deed this property to me. Well, she trusted me enough, she did it. So that was about 8 acres. The other aunt, she had 8 or 9 acres on out to the highway. I got hers in a similar way. I bought it. And, that’s the way I got started in getting some of the Lewis property. Then they were getting close to building that bridge up here and they moved the highway over some and they got on Lewis property. A good bit of it was on undivided property. So they wanted the Lewis family to come up with one person to deal with the state. Well, all my old uncles and aunts and my old cousins agreed that I should be the one to represent them. So I did. By the way, I was the only one among my uncles and aunts, and cousins that had a good job. Back in those days. And I was paying property taxes each year on the undivided portions of the estate. After we settled with the state, then a few of my uncles that were left, they said that somebody ought to be in charge of this undivided part of the property anyway. Because a good bit of it was behind somebody else. Anyway, it wound up that all my uncles and aunts and cousins, except 3 cousins, agreed that … Well, I made a proposal to each one of them, and they agreed, except 3 held out on me, and that put me at about 30 or 40 more acres. Property tax went up and I finally told those three, I said that the time has come for you to buy, to sell, or let’s divide it. I’m not going to pay property tax on the undivided Lewis estate anymore unless I have the title to it. So they said let’s divide it. I said OK. I’ll have it surveyed and have a map drawn. You can pay your portion of that. They agreed to that. After I had the map drawn, I turned the map over to them and I said OK, you tell me how to divide it. And the thing about it was there were about 14 acres down at this area, mostly behind somebody else, and then it was split completely and then it was another 15 acres in between people. I gave the town a little over 10 acres of land, that most of it was classified as wet land, and I thought they were going to make a park area. But they wound up, it’s only a 100 ft. on the highway and goes back 400 ft., over 10 acres, donated it. That area is where they put those ugly ponds out there on the highway. I didn’t give it to them for that, either. The mayor at that point in time, Ray Rothrock, he was interested in having another possible site for a well, on the east side of 421. And that’s another reason why I went ahead and donated it. 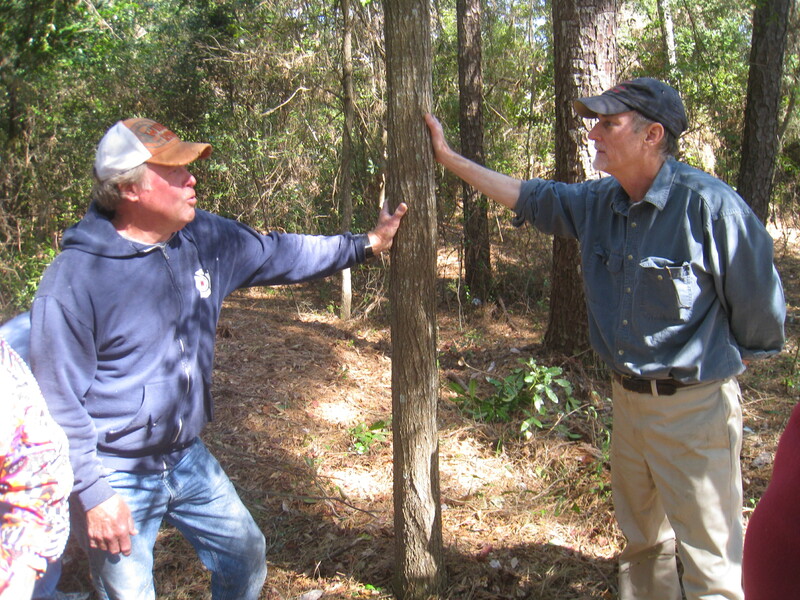 Carolina Beach officials, area historians, professional experts, interested citizens and Historic Society members are currently meeting to develop a plan for preserving Civil War earthworks on Town property donated by Joseph Ryder Lewis, Jr. and family. 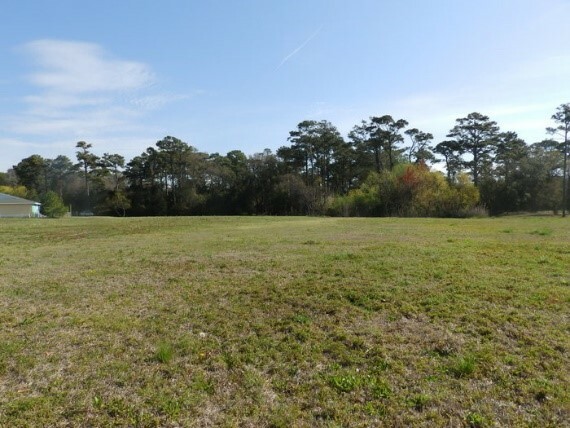 The property on the east side of Lake Park Blvd., across from and just south of Town Hall and behind the water retention pond contains approximately 450 yards of works constructed around 1864 by the Confederacy to prevent an immediate assault by the Union in the event Fort Fisher was captured. This portion was part of a line of works reaching from Myrtle Grove Sound to Cape Fear River. 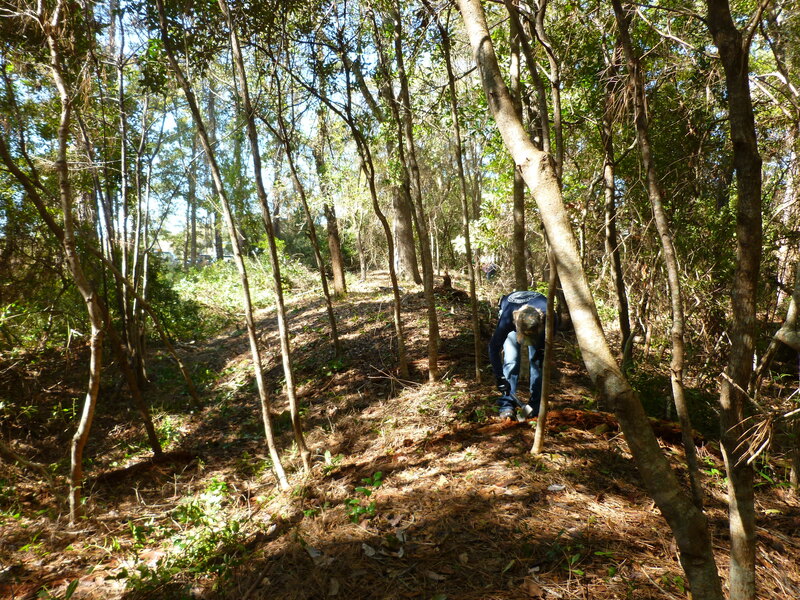 Preservation efforts include clearing of small underbrush (see images on left and below), a thorough survey, educational signage and developing a park setting with possible walking trails and picnic areas. All work will be conducted and supervised by trained professionals in a manner insuring the integrity of this very valuable historic resource. Activity at the Earthworks site first began in 1995 with the development of Carolina Beach Village. “In articles that appeared last August and November (1996) in the FPHPS Newsletter, I mentioned that Society president, Lynn Benson, and Mr. Jack Hart visited an archaeological site known as the Burris Site located at Carolina Beach behind the Federal Point Shopping Center. Mr. Hart, a descendant of the prominent Burris family in the Federal Point community, indicated that an old chimney standing on the site was all that remained of a house built by his great-grandfather, James Thomas Burris, in the early 1800’s. Additionally, Ms. Benson recalled the presence of a child’s grave with a headstone at the site although it could not be located. The grave was believed to have belonged to one of nine children of James Thomas Burris and his wife, Isadora. Also located in the vicinity were the remains of Civil War earthworks. 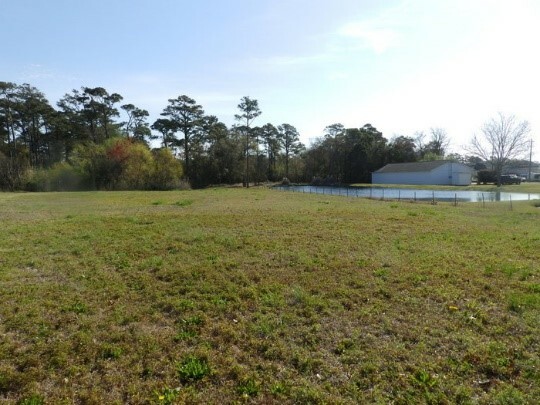 The Burris site and earthworks, unfortunately, were located on property owned and under development by Gulfstream Group, Inc. known as Carolina Beach Village. The developers, required by the U.S. Army Corps of Engineers to conduct a cultural investigation of the area, contracted with an archaeological firm to investigate the site and provide a determination on its significance. “In late October and early November 1995, Coastal Carolina Research, Inc., of Tarboro, North Carolina, conducted limited archaeological testing and documentation of three areas of the proposed Carolina Beach Village. The firm conducted the study for the Gulfstream Group, in compliance with Section 106 of the National Historic Preservation Act of 1966. The purpose of the study was to determine if the three archaeological resources within the study area were potentially eligible for the National Register of Historic Places. The first of the three sites was the reported location of the Burris farm. The site included a standing chimney of the original house and remnants of later outbuildings. 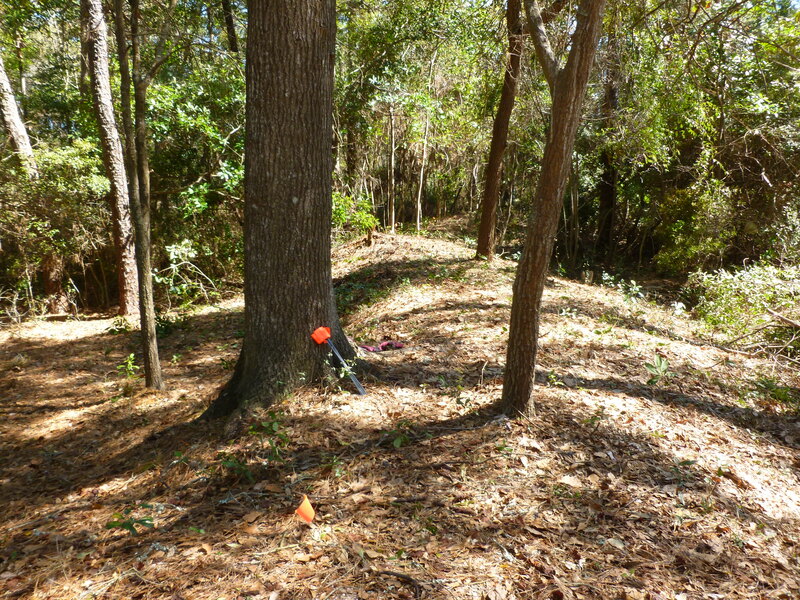 The second site was a small lunette, or rifle pit, associated with the defenses of Fort Fisher during the Civil War known as the Sugarloaf Line. 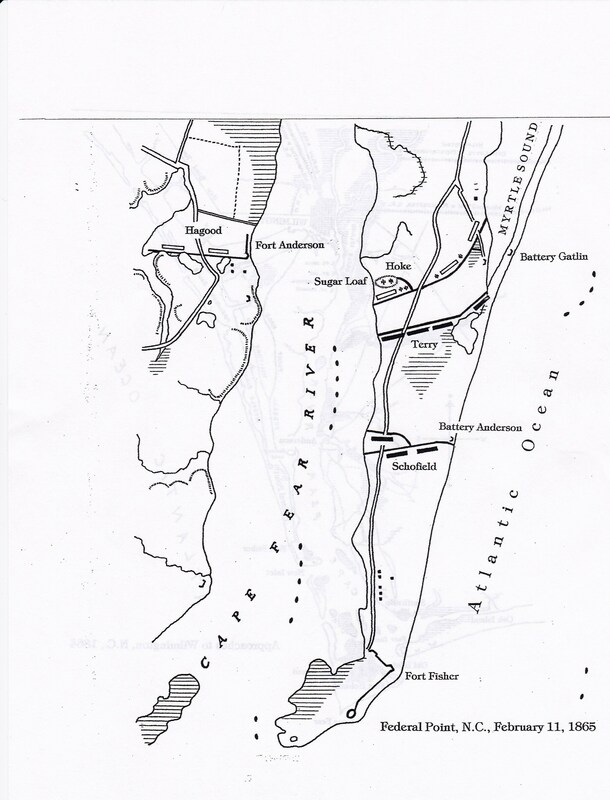 The third site also contained a portion of earthworks associated with the Sugarloaf Line, but was located outside the current permit area for Carolina Beach Village. They were investigated in anticipation of future development of the tract. “The house at the Burris site is thought to date around 1840 and appears on Civil War maps of the area. Only the brick chimney survived. This feature measured 4.6 feet wide and 2.3 feet deep. The stack has a single shoulder and was stepped back. There had been a major repair in the front of the chimney with some concrete blocks added, as well as evidence of recent mortar. An archaeological test unit placed at the east base of the chimney yielded a mixture of mortar and recent artifacts. Archaeologists also placed two other excavation units and a number of shovel test holes within the vicinity. Although a number of artifacts found during the investigation dated to the mid-nineteenth century, the material clearly came from disturbed contexts. A substantial amount of modern debris was found on the surface and within the upper soil layer of units. “The nearby Civil War earthworks associated with the Sugarloaf Line were also examined. At the feature referred to as a lunette, or rifle pit, the archaeologists prepared a topographic map. The lunette was then bisected with a backhoe trench and a profile drawn. The structure measured approximately 20 X 40 feet with the shape of a waxing moon, hence the term lunette. The profile showed that the more vertical, high side of the mound was to the west, sloping to the east. This would have provided the maximum protection to the troops, as expected invasions would have come from the east. The lunette retained its contours and approximate shape. The site appeared eligible for the National Register of Historic Places as a feature of the Sugarloaf Line of defenses for Fort Fisher. The documentation at the site served to mitigate the adverse impacts on the site as a result of the construction of the development. “The final earthworks are apparently an entrenchment also associated with the defensive line. An entrenchment can be any temporary or permanent fortification that provides shelter from hostile fire, serves as an obstacle to hostile advance, and allows the maximum use by the defenders. They would commonly possess an exterior ditch, which provides not only an obstacle to enemy attack, but also the fill for the embankment. The earthworks appear on maps made of the vicinity during the Civil War. The dissected linear earthworks trend from the southwest to northeast and are outside of the current development boundaries; however, the road that will access that area falls in the break between the two sections. The soil, vegetation, and the expanded trunks of the trees indicate that the vicinity was a swamp prior to extensive drainage in the area. The Federal Point Historic Preservation Society will hold its monthly meeting on Monday, April 21, 7:30 pm at the Federal Point History Center, 1121-A North Lake Park Blvd., adjacent to Carolina Beach Town Hall. 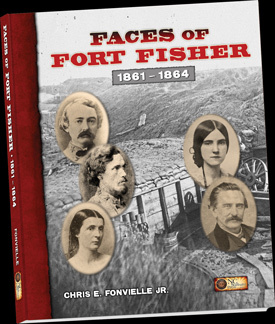 This month Civil War historian, Dr. Chris Fonvielle, will talk about his new book: Faces Of Fort Fisher: 1861-1864. The new book takes a closer look at the officers who planned, designed, and commanded the works, and the soldiers who built, garrisoned, and defended them. The book also explores events associated with the Fort’s fascinating history, including blockade running, Camp Wyatt, President Jefferson Davis’ 1863 visit, the 1864 sortie of the CSS Raleigh, the drowning of the celebrated Confederate spy, Rose O’Neal Greenhow, and much more. Dont miss this months program as Chris is a natural storyteller and knows as much as anyone about the history of Fort Fisher and the whole Federal Point area, during the Civil War period. Copies of his books will be for sale and Chris will be available to sign them personally. 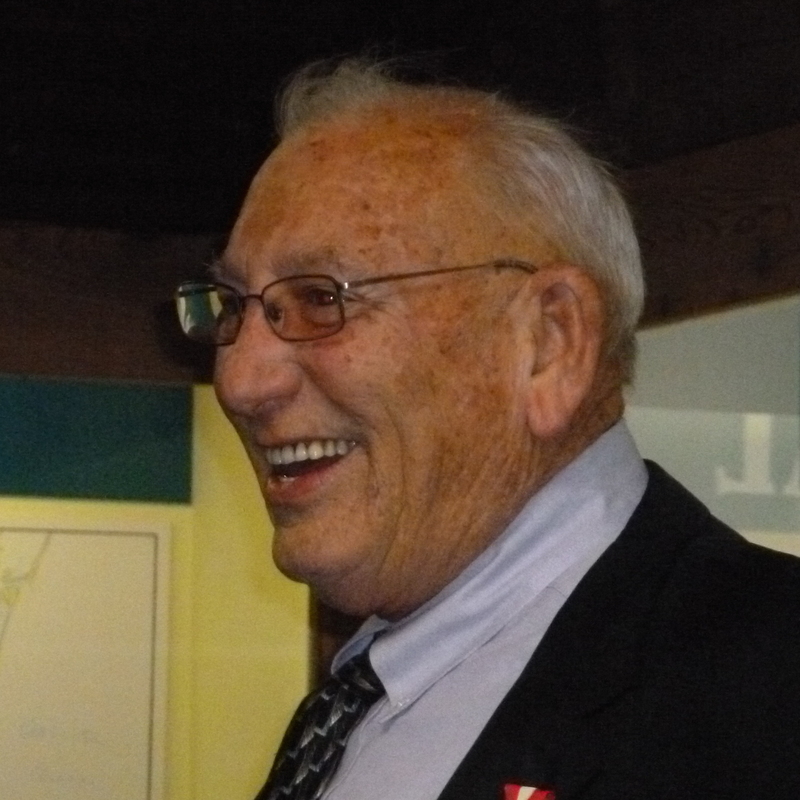 Our March speaker was Michael Vickery, a Board member of Richard Neal’s Frying Pan Tower. 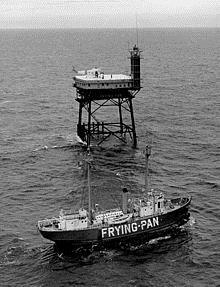 Frying Pan is a shoal area that reaches thirty miles south of Bald Head. In 1854 the U.S. government installed a light ship to warn shipping using the Gulf Stream of the shallows. By 1964 the last light ship was decommissioned and a permanent light tower built to replace it. This included work space and bedrooms to house coast guard personnel. By 2004 GPS had made the light tower obsolete and in 2009 the Coast Guard put it up for auction. The first bids began at $10,000 and Richard Neal bid $11,137.15, his total assets. Then the government stepped in and declared every lighthouse to be worth at least $85,000. Mr. Neal borrowed from a friend and there were no other bidders. Since that time he and friends have spent every possible moment scraping away years of accumulated rust and restoring bedrooms, a modern kitchen, and work spaces . It currently can sleep eight and they hope to increase this to 14. The living platform is 65 feet above the water and the only access is by helicopter or boat with a breaches buoy needed to transport visitors and cargo up to the platform. Primary activities for visitors are fishing and scuba diving with a pool table and sundeck outdoors for rougher days. Weekend rentals are available with food being served,mostly fish, plus whatever is brought from the mainland. The Society would like to express our thanks to Chris Fonvielle for conducting the walk of the Sugar Loaf line again this year. We had 37 people register and take the walk and it was a beautiful and outstanding day. The money collected from the walkers will go into a special fund to be used for preservation of the earthworks on the east side of N. Lake Park. Blvd. Over the years Chris has been more than generous in giving his time and expertise in support of many projects and programs sponsored by the Society. He is also working closely with our Society and the Town of Carolina Beach on the plans for the Lewis Park. Speaking of the Sugar Loaf line… We NEED VOLUNTEERS who are willing to help out on “work days” on the Lewis property. Please call Rebecca (458-0502) and let her know if you are available to “cut brush” and “saw trees” or other general cleanup. Our thoughts and prayers go to the family of Lois Walton, a life-time and founding member of the Society. Lois passed away on March 28 and she will be sorely missed by the entire Federal Point community. Sadly, we have also learned of the passing of Linda Newton on April 8. Linda was a faithful member of the Society and she and husband, Bob, were instrumental in getting the Newton Cemetery and Home Site on the National Register of Historic Place. Our thoughts and prayers go to the whole Newton family. The History Center recorded 85 visitors in March. We had 55 at the March meeting and had 37 take the Sugar Loaf Walk. The gift shop took in a record breaking $465.42. The History Center was used by Got-‘em-on Live, the UDC and the Sugar Loaf Preservation Group. Welcome to new life-time member, Jason Boykin of Carolina Beach and new business member Pleasure Island Foundation for a Sustainable Community. As always thanks to Demetria Sapienza for all her work on the Society’s treasury and for cataloging the DVD programs for the collection. Heartfelt thanks go to both Demetria and Ron Griffin for covering a Saturday Rebecca needed to be off.